From earliest times, the stoic, heroic inhabitants of Hunza Valley (Hunzakuts) sandwiched between the Hindu Kush and Karakorum Ranges in northern Pakistan have been assailed by invaders - geologic, political, climatic and touristy - that would have reduced a lesser people to penury or wiped them out altogether. Hunza has been ruled by the family known as Mirs of Hunza (called Thums) for centuries. Hunzakuts are believed to be the descendents of soldiers of Alexander the great who were left over battle march forward. The people of Hunza speak Brushuski, an aboriginal language. The medieval state retained its isolated independence for a long time in the remote part of the areas which now form the Northern Areas of Pakistan adjoining the Sinkiang region of China. 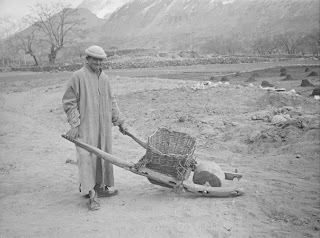 During early nineteenth century, Hunza resented Kashmir’s attempts to gain control and its rulers periodically expelled Kashmir garrisons, threatened Gilgit, and politicizing with the rulers of Kashgar to the north where the Russians were gaining influence. Fearing Russians infiltration into their northern frontiers, the British took over direct political control at Gilgit in 1889. Bloody manoeuvrings in Hunza and Nagar made the areas doubly insecure. This, coupled with the Mir of Hunza’s consistent intransigence tempted the British to march on Hunza in December 1891, where they fought a decisive battle at Nilit, 60 kilometres beyond Diaynor Bridge. After this the British garrisoned Aliabad until 1897 when Hunza became a princely state protected by the British. After Pakistan was created, the people of Hunza also gained liberation and later the princely state was merged in Pakistan. Travelling to the Hunza Valley in the past required walking (or driving a wretched track) through the roughest mountain glen on earth but these days one can commute on Karakorum Highway – ranked one of the highest highways in the world - to reach Karimabad – principal town in the Valley.